Over one year ago, I posted on Reddit (Original Post) about the circulating board game collection we started at my public library. It was received with a lot of interest and great questions, but to be honest, I was still unsure how the collection would be used by our patrons (i.e. our taxpayers). The short of it is…the collection is going really great! While usage statistics aren’t everything, people are taking a ton of games out of the building (see below), the collection has grown substantially, and we are providing programs to support the collection. …but because statistics are important, here are our top 10 all-time individual circulating games. You’ll see our most used items tend to be gateway/party games, but Twilight Struggle and Terra Mystica have also received 7 circ’s each. Since I started the collection, I have learned quite a few things. I’d like to share six lessons I’ve learned while managing the collection in the first year. Shelf 1 of 2. We use face out shelving to make the collection look more appealing. …but so does everything else. The first reaction I had to face (in myself and others) when advocating for the circulating board game collection was, “What if the pieces go missing!” Happy to say, so far the collection only has had around 5-6 games that have been damaged or had missing game-impacting pieces that we couldn’t fix out of a total of 67 titles. Compared to the number of books that are coffee-stained, filled with sand, or have broken bindings, I think we are doing pretty well so far. When the library started the collection, I was still learning quite a bit about the amazing board game community. I was only vaguely aware that several other libraries had already forged the way. Right before we ordered, I was able to get statistics from the Urbana Free Public Library’s circulating board game collection in order to make sure I was selecting games that would be well used. In addition, many gaming conventions have board game libraries and publish usage numbers after the event, for example BGG Con 2015 and Pax South 2017. Trying to put together a collection on a budget? Many publishers allocate demo copies for stores and libraries. Others are happy to send over some of their most popular titles. The library had amazingly generous donations from GMT games and Rio Grande Games, which have circulated quite well. That is not to say that I wasn’t rejected by publishers, but support for a good cause exists. Donating also helps these companies build an audience. I’m also in talks with a game distributor to provide games at deep discounts and/or free ding and dent copies. Not every library may be so lucky, but we have a great relationship with a FLGS (Friendly Local Game Store) that opened down the street this year. Better yet, this store’s prices are often lower than the leading online retailers (how this is possible, I have no idea!). I make a few bulk purchases from the store when time is not a factor, and then made rush orders for specific requests online. 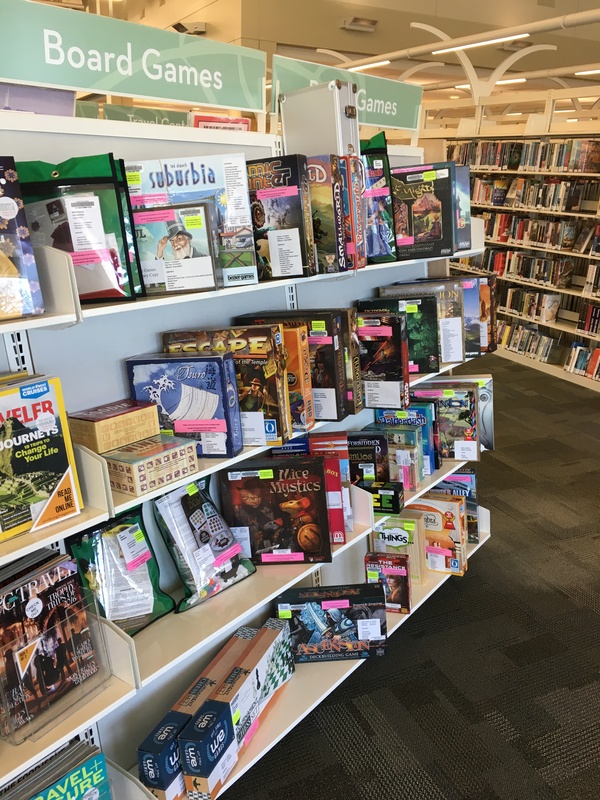 Ultimately, the success of this local game store builds interest in the hobby, supports the community, and creates a potentially invaluable local partner. This game store now regularly holds Magic the Gathering drafts and board game events in the library. New orders waiting to be processed! One of the most common refrains from staff members when the collection first came out was, “I don’t know any of these games.” This was an interesting challenge to face, because I wasn’t at all sure what type of gamer (if any) would utilize the collection most. Should I change course and purchase more recognizable titles? First the library tries to order as many patron requests submitted through the website as possible. When evaluating a request, I’ll use many of the same metrics that a librarian would use for selecting a book (e.g. reviews, popularity, cost, availability, etc.). I also regularly try to pickup the “new hotness” to keep people coming back. These are typically less accessible, but do much better during Board Game Club. Additionally, we purchased some board game classics such as dominoes sets, mahjong, and culinary trivia games to appeal to a broader audience. These classics tend to do more poorly than their contemporary counterparts except for the party games. One soft-limit I have imposed has been keeping the collection adult-centric. Kids’ games and family favorites are located in the children’s department circulating collection that started a few months after our own. — public programming that is. The best way to advertise our available collection has been finding people that are passionate about board games, and listening to them. For over a year EPL has co-hosted a board game night in collaboration with staff from a different local gaming store at a coffee shop within walking distance of the Library. The coffee shop offers a relaxed atmosphere for newbies and veterans, and the space already attracts people who might be interested in playing on its own. By participating, I’ve also been able to spend lots of time with residents who have suggested multiple titles for the collection. As another tidbit, I also had two Elmhurst residents come into the building a day or two after seeing my first post on r/boardgames! Hopefully this helps give some insight to the process. I’ve read a lot of comments on my original post and elsewhere that say, “That is incredible, I wish my library would check out games too!” I always tell them to give that suggestion to a friendly community librarian. In addition, if you are one of these people, I encourage you to get in touch with me as well. Does your public library circulate board games? Have you asked them yet? Let me know in the comments! Our local libraries do not have board games in circulation currently, but I’ve sent our good friends who work at the library your article! Thank you very much for taking the time to write about your experiences! I’d be interested to know if you were able to acquire replacement parts for games which had missing/broken components, and if so how? Thanks for passing it along! Many board game publishers regularly replace missing pieces when contacted about them. This is not something we have not pursued due to the fact that we have a stable budget and at this time can purchase a replacement copy, but I could see us doing this in the future. For a few games when pieces have gone missing, I have 3D printed replacement parts as well! Hope this helps. I noticed from the pictures that the board games are not in sealed containers or anything. Do you check contents before they leave the library to make sure they are all there? You are correct, currently we keep the games out, but our Kid’s Department keeps games behind the desk to preserve their condition. When a patron checks out a game, the circ staff check the box to see if things look more or less intact. I’m trying! I wrote a proposal to our director for the new fiscal year. I got a lot of my information from your Reddit article. Thanks for sharing your lessons. My local libraries (in the UK) loan jigsaws, which look well used. Would be interesting to hear if board games might be popular too. I love the fact that there are other libraries doing this. We have been circulating games for about two years now. It is going well, but there is always room for improvements. I was wondering what content you include on the labels on the front of your games?